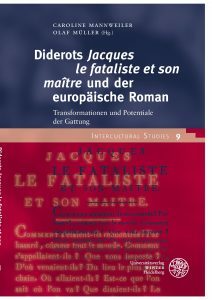 Denis Diderot's Jacques le fataliste et son maître is one of the most influential novels of the 18th century, which, during his lifetime, the author reserved for an exclusive readership, and, which appeared in book form only posthumously. The novel, itself a reaction to and a practical reflection on various varieties of novel genre from antiquity to its present time, earns productive updates from Schiller and Goethe about Puškin, Machado de Assis and Brecht to Kundera, Henri Lopes, Cécile Avouac or Sophie Divry and on into current contemporary literature again and again. As the many story-within-the-stories in Jacques le fataliste et son maître prove, Diderot was quite the capable storyteller. But he would not be contented with that. Instead, his novel provides a wealth of arguments addressing the production and reception process of novels, which is exhibited in detail in this volume across historically convincing individual studies on examples of European and Latin American literature. Diderot's novel was and is especially valuable for authors who, in theoretical considerations of novels, recognize not a hollow game, but a foundation for the novel.